Can JSON field values corresponding to Metabase User API fields be made to add new users programmatically? How can that information be unpacked and applied to programmatically add a new user? The intention is to provide metrics to users via Metabase on a paid subscription basis with two or more tiers of content access without having to manually associate new users to a group. Any suggestions, example applications, pointing in right direction would be appreciated! 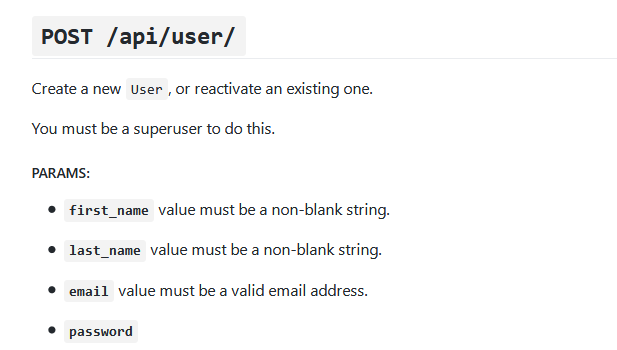 Thank you, did wonder about additional documentation on the api/user.clj… Feeding JSON field values into and or invoking the same is another matter. To the initiated this must be quite trivial. To a neophyte like myself, however, what that bridge between the “gift-wrapped” JSON values and the api/user is supposed to look like and how it is made to function is still vague. Me thinks I’m in for a bit of learning curve! I think it’s mostly because 2nd post of Any API or programmatic way to add users actually is a “self answer” to the question over there with the curl command line example of using Metabase’s REST API. Then there was not much need for additional answers in that thread. I hope that’s the gift wrapping magic you’re looking for? Thank you so much! Now this looks like the kind of nitty-gritty required for the job!